The nature of diabetes does not typically lend itself to taking part in extreme sports and activities. Short-term complications attributed to both type 1 and type 2 diabetes mean that risk inherent in extreme sports are even more risky for diabetics. The influence that high or low blood sugar levels can have on the body may prohibit some diabetics from taking part in extreme sports, but this is not always the case. 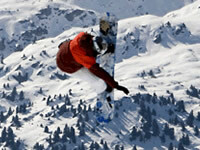 Extreme sports include high-risk activities such as rock climbing, paragliding, parachuting, scuba diving and surfing. Although all of these sports may not necessarily fit into the popular definition of extreme sports, for the purposes of diabetic involvement they may be considered as a group. Why shouldn’t diabetics take part in extreme sports? Diabetes needn’t necessarily prevent individuals participating in extreme sports. However, sports that require a high level of fitness and provoke an adrenaline-based reaction of extreme excitement might not suit all diabetics, and should be carefully considered and discussed with a doctor or medical healthcare professional. People taking certain medication, such as insulin, may find themselves excluded from certain sports such as scuba diving. In this case it is the organiser’s responsibility and therefore their decision. What should diabetics wishing to participate in extreme sports do? Diabetic patients wishing to participate in extreme sports should, following the go-ahead from doctors or healthcare participants, evaluate exactly how the activity will affect their blood sugar levels, and prepare for this reaction by packing testing equipment, insulin/medication, food and water. People with diabetes taking part in sports of this nature should carry identification that displays their condition, as well as perhaps wearing an alert bracelet.